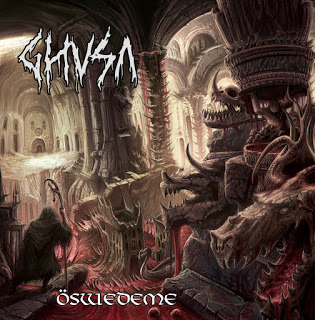 Continuing to uphold their country’s output, French death metallers Ghusa have utilized the famous style Swedish attack that was at the forefront of their original evolution years ago and brings them back from the grave once again to deliver the onslaught. After over a decade of silence that only included a compilation release in the interim, the bands’ sophomore album was originally released May 5, 2017 on White Square Records. Once this one gets going, the full-force of their Swedish influenced take on this style comes across in rapid succession as there’s little denying those elements. Tracks like Project 9, Sickening and In Gods We Fear take that focus on the rapid, tight rhythms featuring plenty of swirling buzzsaw grooves throughout here that feature plenty of utterly ferocious rhythms, thrashing patterns and that lively bouncy set of riffing that gives the material a great atmosphere in the faster sections. Even the slower sections like Epitaph and Carve Up contain a steady mid-tempo groove with plenty of tight, thunderous rhythms and a rather stylish series of riff-work which gives this a rather enjoyable air as well as plenty of diversity compared to the faster sections alongside these efforts. While none of this is particularly groundbreaking or original in the slightest as it’s basically just yet another band playing vicious and intense Swedish-styled death metal, it’s pretty much the main strike against the album where it doesn’t really offer up many flaws beyond its rather familiar and overly-accomplished style.